Fender’s line of amplifiers includes one of the most legendary combos ever made. Fender ’65 Princeton Reverb was and still is among the most impressive guitar amps you can get for just under $1000. Today we are going to find out what makes it so awesome and why it’s popular. First thing you need to know about Fender ’65 Princeton Reverb is that it’s a revamp of a legend. Fender’s decision to do so has proven to be one of the better things to happen in guitar amp industry. Another good decision was to keep everything almost exactly the way it was. In terms of controls, you are looking at a fairly simple setup. There are two instrument inputs, a volume knob, a simple two band EQ and reverb controls. These include a reverb knob, speed knob and intensity knob. Nothing complicated at all.. As a matter of fact, getting used to this amp is surprisingly easy. It takes maybe a half an hour to figure things out. Fender could have packed this amp with all of the stuff we see in modern tube amps, but they didn’t. That is something we wholeheartedly appreciate. The core of Fender ’65 Princeton Reverb are its complement of vacuum tubes. We have three 12AX7s, a single 12AT7, two 6V6 tubes and a single 5AR4 rectifier tube. That is pretty much the very same setup the initial amp had back in the day. Overall power output is rated at 15 Watts at 8 Ohms. All of the juice is pushed through a single Jensen Special Design C-10R 10″ speaker that does the whole package justice. Generally speaking, if you are looking for proper vintage sound, it doesn’t get much better than this. One of the more common ways to boost the flavor of Fender ’65 Princeton Reverb even further is to swap out those 6V6s for a better pair. That said, the ones that come with the amp are made by Groove Tubes, and those are far from mediocre or bad. There are numerous tube amps on the market at the moment, designed and produced by just about every major amplifier brand. Even so, Fender’s model we are looking at here stands out. It is a single channel amp with one of the most beautiful cleans you will ever hear. When people talk about ‘vintage guitar sound’, this is exactly what they mean. Best of all, you can push it into a warm and all natural overdrive without any consequences. It produces that raspy dirt which has become the trademark of classic rock a long time ago. If that is not enough, it is worth knowing that Fender ’65 Princeton Reverb plays very well with guitar effects pedals. Considering it produces 15 Watts of power, it might not be the best tool for gigs in larger venues. However, put this bad boy in a recording studio and you’re in business. 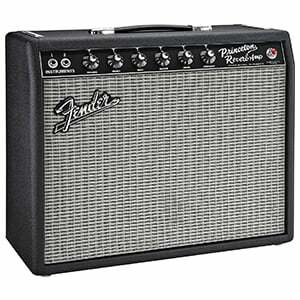 For more info about the Fender ’65 Princeton Reverb, click here.